Our next Annual General Meeting will be held concurrently during the Academy of Prosthodontics meeting from May 29 - June 1 2019 in Banff, AB. Please mark your calendars and make plans to attend as this promises to be another exceptional meeting taking place at the beautiful Fairmont Banff Springs Hotel. 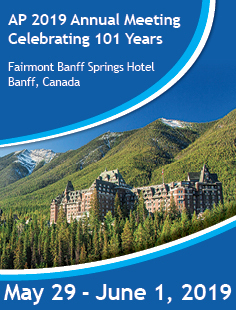 The APC AGM will take place on Saturday, June 1st at 1 pm in the Frontenac room at the Fairmont Banff Springs Hotel. A light lunch will be served. The Registration is free but an RSVP is requested for the APC AGM to assist in estimating catering and seating arrangements. Note: Since the AGM is a members-only meeting, you'll need your APC website login and password to RSVP. You should have your login and password from recent AGM announcement renewal emails. If you've forgotten your password, click the "Forgot Password" link in the login page, enter your email address and it will be automatically sent to the email address we have on file for you. If you do not received the password within the hour, please email administrator@prosthodontics.ca. You may need to update your email address in our records. To register for the Academy scientific sessions, please visit the Academy of Prosthodontics website. The 2018 draft AGM minutes are available to download here (member login required). The 2018 agenda, proposed budget, financial statements will be available shortly. If you cannot attend an AGM, please take a moment to download the Proxy Form and fill it out. You may give your proxy to any Active member or assign it to a member of the executive. If the proxy is assigned to a member of the Executive, it can be emailed (administrator@prosthodontics.ca) or faxed (604-263-1773) to the administrator for delivery to the Executive. You may download the agendas, schedule of speakers, past meeting minutes, financial statements and budgets on the Meeting Minutes page in the members-only section of this site. A login is required to access this page and these files. The Association of Prosthodontists of Canada has received reports of allegedly professional conferences that have failed to provide the promised roster of speakers or venue. While we cannot provide a comprehensive list of all legitimate conferences, the list below represents several well-respected, longstanding opportunities for professional development open to registration for Prosthodontists.